Item Size: 8-1/2" x 7-3/4"
Ask a question about this productQuestion? 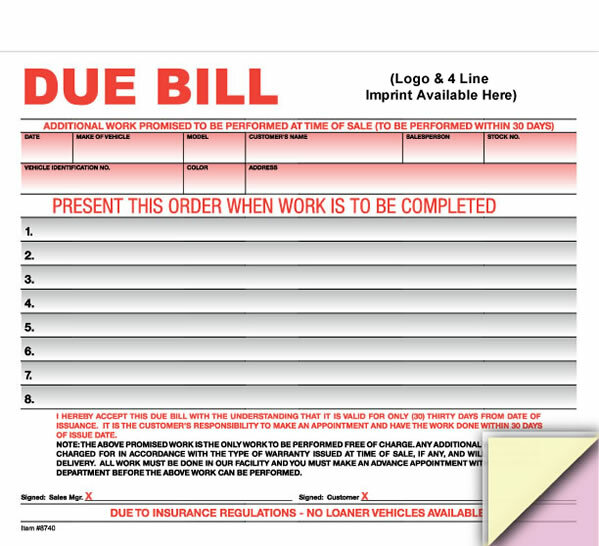 This Automotive Due Bill Form will help you avoid confusion and costly misunderstandings with a written record of all equipment and service promised to be complete after vehicle delivery. All work to be completed after the sale is clearly spelled out on this 3-part form. Please allow an extra 7 to 10 working days for production if you choose the Personalization option. We will email you a PDF proof for your approval before production begins. Please feel free to call us at any time with questions. Most in-stock orders arrive in 2 to 4 working days using standard ground shipping. We're up-front and transparent about shipping cost. Click for detailed information on shipping cost.